SpaceX's robotic Dragon capsule could be modified to help bring Mars samples back to Earth, some researchers say. 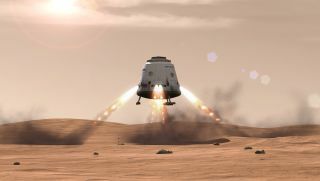 A mission that uses SpaceX's Dragon capsule to help bring chunks of Mars rock back to Earth for analysis could launch as early as 2022, researchers say. This "Red Dragon" project — which remains a concept at the moment, not an approved mission — would grab samples collected by NASA's 2020 Mars rover and send them rocketing back toward Earth, where researchers could scrutinize the material for possible signs of past Red Planet life. Red Dragon is "technically feasible with the use of these emerging commercial technologies, coupled with technologies that already exist," Andy Gonzales, of NASA's Ames Research Center in Moffett Field, California, said Wednesday (Sept. 9) during a presentation with the space agency's Future In-Space Operations (FISO) working group. The Red Dragon team has developed the concept independently, without any involvement or endorsement by SpaceX, Gonzales said. Mars is a cold and dry place today, but evidence gathered by NASA's Mars rover Curiosity and other spacecraft suggests that the planet was warmer and wetter, with lots of surface water, billions of years ago. Many scientists therefore believe life may have evolved on ancient Mars. Searching for signs of past Mars life is a tricky and involved process, so the best and most conclusive results would probably be obtained by trained personnel working in the well-equipped labs of Earth, rather than by a robotic rover or lander operating millions of miles from its handlers, astrobiologists say. Indeed, the U.S. National Research Council regarded Mars sample-return as the highest-priority big-budget future NASA mission in its 2013 Decadal Survey for planetary science. That's where Red Dragon could come in, Gonzales and his team say. The basic outline of the “Red Dragon” Mars sample-return concept, which would use SpaceX's robotic Dragon capsule and Falcon Heavy booster. The researchers have drawn up a plan that uses a modified version of SpaceX's uncrewed Dragon cargo capsule, which has already flown six resupply missions to the International Space Station for NASA. The Red Dragon variant would include a robotic arm, extra fuel tanks and a central tube that houses a rocket-powered Mars Ascent Vehicle (MAV) and an Earth Return Vehicle (ERV). Red Dragon would launch toward Mars atop SpaceX's huge Falcon Heavy rocket, which is scheduled to fly for the first time next year. After a long deep-space journey, the capsule would touch down near the 2020 Mars rover (whose landing site has not yet been chosen). "Red Dragon can go anywhere the rover can go, as far as landing elevation and terrain," Gonzales said. "We're confident we could land in front of the rover and have it drive to us." Red Dragon's robotic arm would then grab a sample from the rover's onboard cache (assuming the 2020 rover does indeed carry its samples, rather than stash them someplace) and transfer it to a secure containment vessel aboard the ERV, which sits atop the MAV. If something goes wrong during this exchange, Red Dragon can simply scoop up some material from the ground using its arm. The MAV would then blast off from the center of the capsule, like a missile from a silo, sending the ERV on its way back to Earth. The ERV would settle into orbit around our planet; its sample capsule would then be transferred to, and brought down to Earth by, a separate spacecraft — perhaps another Dragon capsule. The ERV, meanwhile, would be placed in a sun-circling orbit so it could not contaminate Earth or the moon with stray Mars material. There's no reason why this potential mission should not work, Gonzales said. Even the most eyebrow-raising part of the plan — landing the roughly 10-ton Red Dragon capsule softly on Mars — is feasible without any big technological leaps, he and colleague Larry Lemke, a now-retired former Ames researcher, stressed during the FISO talk. Red Dragon is too heavy to use parachutes, but it could slow down enough for the SuperDracos to take over by entering the thin Martian atmosphere at a relatively shallow angle, thereby subjecting itself to the effects of drag for a long period of time, Lemke said. So how much would all of this cost? It's unclear at the moment, because the team has not yet drawn up any cost estimates. But Gonzales said he's hopeful that the Red Dragon concept would be considerably cheaper than the Mars sample-return effort envisioned by the 2013 Decadal Survey, which would likely cost around $6 billion.